Pigsy was a great character in Enslaved. His wise cracking remarks and conversations with Monkey were pretty hilarious and showed what kind of guy he was. Always ready to help out a friend in need, Pigsy's was a critical character towards the end of Enslaved. With Pigsy's Perfect 10, He gets a chance to shine once again. It's a bit lonely in the wasteland, so Pigsy decides to use his skills with scraps to seek out parts to build a friend with the help of his AI buddy Truffles. On his quest, Pigsy learns a valuable lesson, and one that helps shape the original story of Enslaved. 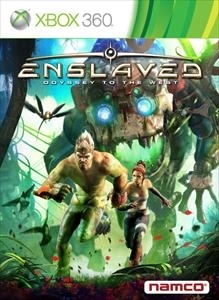 This roughly 2-4 hour story is before the events of Enslaved and offer up a chance to take on the Mechs in a very different way. Pigsy bite isn't that great compared to his bark, so you'll have to rely on his gadgets to take on the Mechs when you have to. The main preferred weapon for Pigsy is his Sniper/Assault Rifle. When zoomed in, shots become more powerful, and zoomed out fire like an Assault rifle which can even be fired in burst. The Weapon is fun to use, but you'll also have gadgets at your disposal when you want to be more tactical. You'll eventually unlock four gadgets at a time and all are very useful since Pigsy can only take a few hits before dying. I probably died as Pigsy 4 times often then when playing as Monkey. Although it became a little frustrating, it was really to cool to play in the world of Enslaved from a different point of view. A cool bonus for getting the DLC will give you the ability to play the game in 3d. Utilizing TriOviz and Stereoscopic 3d, you can play Pigsy's Perfect 10 and the entire Enslaved game on any type of TV. I played on an LCD monitor and at night once you focus your eyes, the 3d becomes a really cool effect. The lush backgrounds pop out a bit, and zoomed in on the scope of the rifle felt really neat. You also have the ability to change the 3d strength so you can play for longer in 3d or have a friend watch without the need for glasses. Pigsy's Perfect 10 has a great story and provides more hours of great gameplay in the world of Enslaved. The 3d effect is cool, and although you'll die often, It was still fun to play the game in a different way. Definitely worth the 800 MSP ($10).